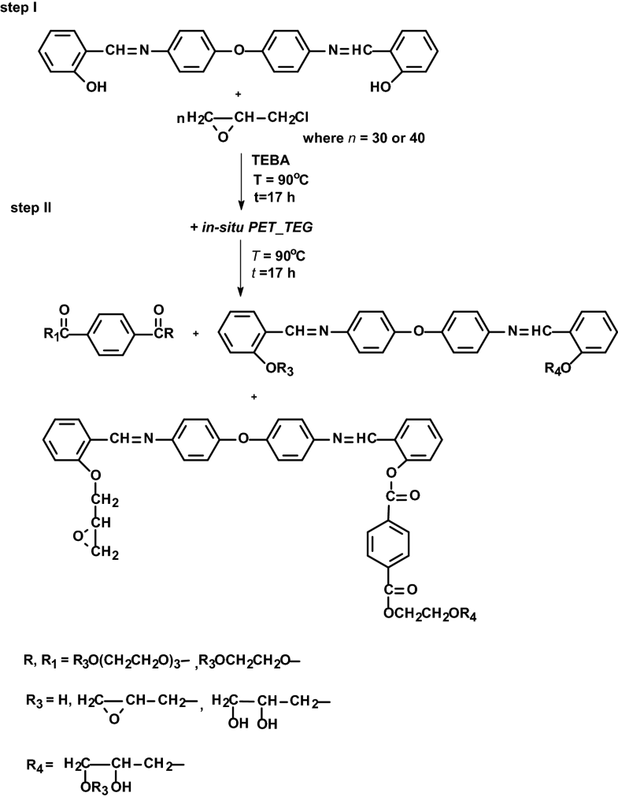 Chemical modification of Schiff base epoxy resins involves introduction of waste PET degradation products into a synthesis reaction between N,N’-bis(2-hydroxybenzylidene)-4,4’-oxydianiline and epichlorohydrin or introduction of a flexibility spacer between the mesogenic units in a reaction with epichlorohydrin. This provides the resins with much lower glass transition temperatures. All used Schiff bases are the derivatives of 2-hydroxybenzaldehyde. Synthesized epoxy resins were used as a component of binder of new organic coatings. 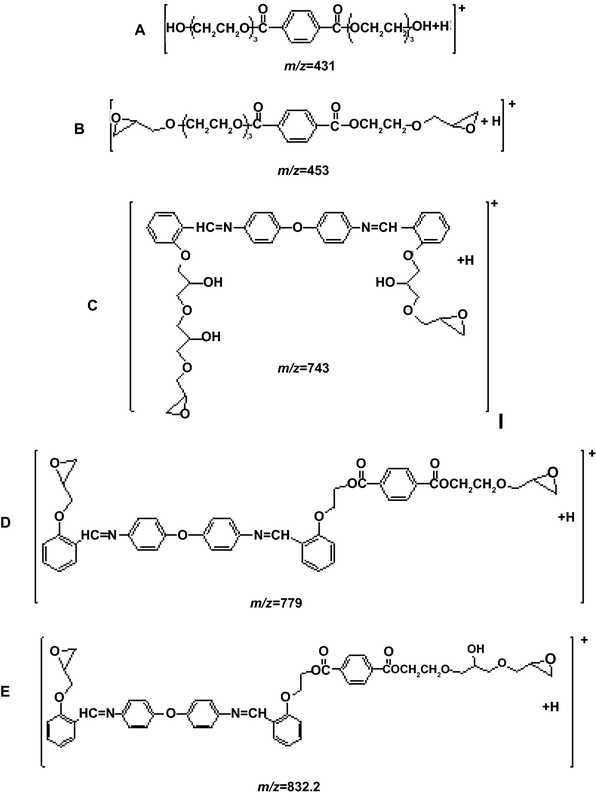 Xylene-based solution of polyamide based on dimerized fatty acid and polyamines and poly(oxypropylene diamine) were used as a hardener for the synthesized and commercial epoxy resins at room temperatures. Physical and mechanical properties of coatings based on new epoxy resins were determined. Results were compared with those for one selected commercial epoxy resin. The results of investigations prove that coatings based on new epoxy resins have good elasticity, impact resistance, and their adhesion to the substrate is comparable or even better than that of coatings based on the widely used commercial epoxy resin. In the present study, we report on two methods for the modification of Schiff base epoxy resin in order to obtain flexible, organic coatings with very good physical and mechanical properties. One of the methods of modification involves the use of a Schiff base, derivatives of 2-hydroxybenzaldehyde, with a flexibility spacer between the mesogenic units in a reaction with epichlorohydrin. The second one involves the introduction of waste PET degradation products into a synthesis reaction between N,N’-bis(2-hydroxybenzylidene)-4,4’-oxydianiline and epichlorohydrin. These modifications have made it possible to obtain resins with lower glass transition temperatures ranging from − 9°C to as low as − 33°C. 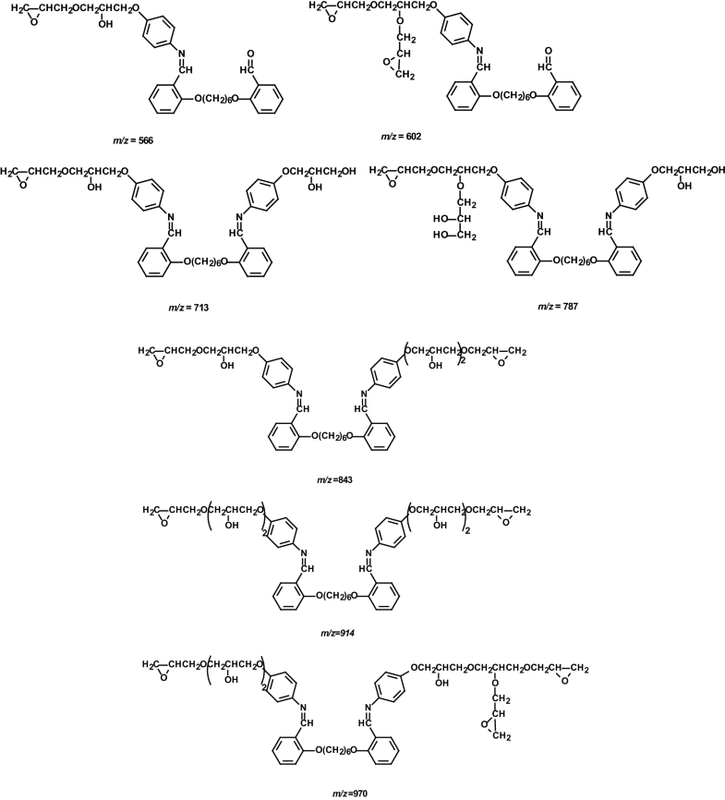 The Schiff base (OA) compounds based on 2-hydroxybenzaldehyde and 4,4’-diaminodiphenylether were synthesized according to our previously published procedure.19 However, the Schiff bases (1,x-o-DPA) based on 1,x-bis(2-formylphenoxy)alkanes and 4-aminophenol were synthesized as previously described by Choi25 with some modifications, one of which included using methanol instead of 95% ethanol. Xylene-based solution of polyamide based on dimerized fatty acid and polyamines (Epikure 3115-X-70, Momentive Specialty Chemicals, amine value 161–173 mg KOH/g) and poly(oxypropylene diamine) (Jeffamine D-230, Huntsman, amine value 974 mg KOH/g) were used as a hardener for the synthesized and commercial epoxy resins. The properties of the coatings based on the synthesized resins were compared with the properties of coatings obtained at the same time, which were based on the commercial resin Epidian 6 (Ep 6) (Z.Ch. Organika-Sarzyna). Ep 6 is the epoxy resin obtained from BPA and ECH with molecular weight ≤ 700 g/mol and equivalent weight of 190 g/equiv. The waste PET (50 g) was reacted with triethylene glycol (TEG) in weight ratios of 55/45 wt/wt. 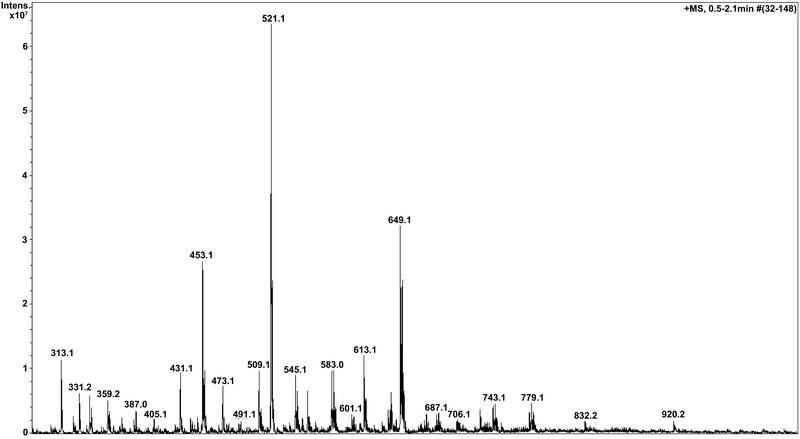 Degradation was carried out in the presence of 0.06 wt% of monobutyltin oxide (in relation to PET) in a nitrogen atmosphere within a temperature range of 190–200°C for 2.5 h. The number average molecular weight of the depolymerization products was determined by SEC and amounted to 710 g/mol and dispersity index of 1.8. The oligomer of glycolyzed PET waste and TEG is abbreviated here as PET_TEG. ECH was added into a three-necked round-bottom flask and heated to 40°C. Then, Schiff base and 5 mol% of the phase-transfer catalyst TEBA (per mole of the Schiff base) were introduced in portions. The amount of the reagents used is given in Table 1. The reaction temperature was raised to 90°C. The synthesis processes, where Schiff base 1,x-o-DPA was used as a reagent, were heated for 24 h. Afterward, 150 ml of hexane was added to the reaction mixture and mixed for 1 h. The hexane soluble fraction was separated, while a part of the epichlorohydrin was distilled. The residue was washed with ethanol thoroughly in order to remove PTC. The product was additionally dried under a pressure of 3 mbar (300 Pa) for 3 h (Fig. 1). Where Schiff base of N,N’-bis(2-hydroxybenzylidene)-4,4’-oxydianiline (OA) was used, PET_TEG was added after heating for 17 h. Its amount was determined based on an assumption that for 1 mol of diglycidyl ether of a given Schiff base, there should be a corresponding mole of PET_TEG. The reaction was continued for another 17 h. The subsequent procedure was identical to the synthesis of epoxy resins described above (Fig. 2). The epoxy resins obtained were dissolved in a mixture of solvents: xylene/methyl isobutyl ketone/1-methoxy-2-propanol at a weight ratio of 50:30:20.26 A stoichiometric amount of hardener was added to 50% solutions of the above. Jeffamine D-230 or Epikure 3115-X-70 was used as hardeners. The resulting mixture was applied onto steel panels to determine adhesion to the substrate, flexibility, and impact resistance. The coatings were hardened at room temperature and conditioned before the tests according to the requirements set out in the applicable standards. Nuclear magnetic resonance (NMR) spectra were recorded using a UNITY/INOVA 300 MHz (Varian Associates Inc.) multinuclear NMR spectrometer. 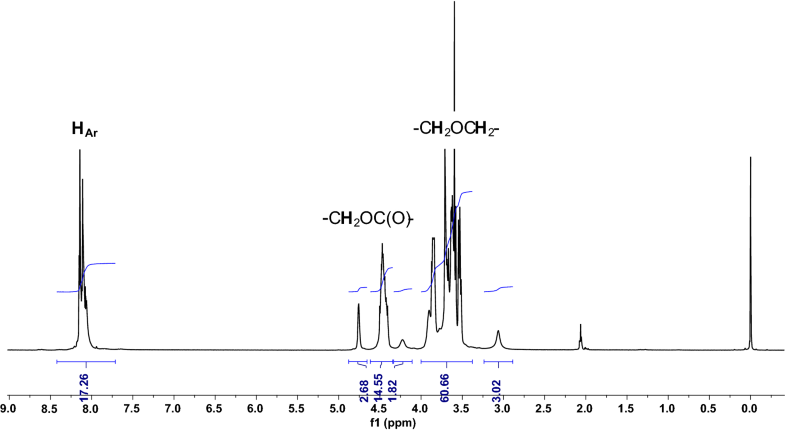 1H NMR spectra were run in deuterated chloroform (CDCl3) or acetone (acetone-d6) using tetramethylsilane (TMS) as an internal standard. Differential scanning calorimetry (DSC) analyses were carried out using a DSC Mettler Toledo 822e calorimeter. Measurements were taken at a heating rate of 5 K/min in a nitrogen atmosphere in the range from − 60 to 100°C. The epoxy equivalent (EE) was determined according to the standard PN-87 C-89085/13. Electrospray ionization–mass spectrometry (ESI–MS) of the epoxy resins was produced on an Esquire 3000 quadrupole ion trap mass spectrometer (Bruker-Daltonics, Bremen, Germany). They were acquired over the range of m/z 50–3000 in the positive ion mode. The flow rate was maintained at 3 μL/min. Samples were dissolved in CHCl3. 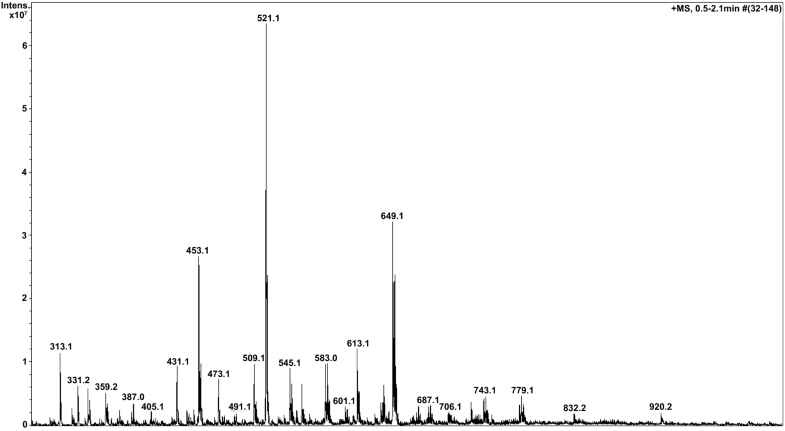 The spectra were analyzed using Bruker Data Analysis software (ver. 3.0). A size exclusion chromatography (SEC) measurement was taken at 30°C in CH2Cl2 with a nominal flow rate of 0.5 mL/min. A refractive index detector (Agilent 1260 Infinity) and a column system (precolumn PLgel 5 µm Guard and PLgel 5 µm MIXED-C) were used. The measurement was performed for samples with a concentration of 1 mg/ml in relation to polystyrene references (Agilent Technologies). The results were evaluated using Addon Rev. B.01.02 by Agilent Technologies. Impact resistance was determined according to the standard EN ISO 6272-1 Paints and varnishes—Rapid-deformation (impact resistance) tests—Part 1: Falling-weight test, large-area indenter. Adhesion to the substrate was determined according to the standard EN ISO 16276-1 Corrosion protection of steel structures by protective paint systems—Assessment of, and acceptance criteria for, the adhesion/cohesion (fracture strength) of a coating—Part 1: Pull-off testing and EN ISO 16276-2 Corrosion protection of steel structures by protective paint systems—Assessment of, and acceptance criteria for, the adhesion/cohesion (fracture strength) of a coating—Part 2: Cross-cut testing and X-cut testing. The resistance of the coatings to bending was determined according to the standard EN ISO 6860 Paints and varnishes—Bend test (conical mandrel). A device equipped with a truncated conical mandrel was used in the test. The coatings were tested on a steel substrate. The results were presented either as “+” or “−” where “+” was a positive result, the coating’s surface was left undamaged, and no cracks can be seen, whereas a “−” sign meant the test was a failure, the coating was not resistant to bending, cracks can be seen, and chipping marks are present. Tensile strength and elongation at break were determined according to. EN ISO 527-2. Flexural rigidity of material was determined using the Handle-O-Meter method. The principle of the H–O–M method consists in bending a sample of the material in the form of a strip using a testing machine by pressing the sample into the gap and measuring the largest resistance. Hardness was determined according to the standard EN ISO 1522—Paints and varnishes—Pendulum damping test. This article presents two methods for the chemical modification of Schiff base epoxy resin. The modification was done in order to decrease the resin’s glass transition temperature, which influenced the changes of coating properties, especially the flexibility. The first modification involved the incorporation of Schiff base, derivatives of 2-HB, with methylene spacers between the azomethine groups (1,4-o-DPA or 1,6-o-DPA). The second method involved the modification of Schiff epoxy resin obtained from epichlorohydrin (ECH) and (OA), as described earlier in the publication, by adding the products of the glycolysis of waste PET via triethylene glycol (PET_TEG) into the reaction. 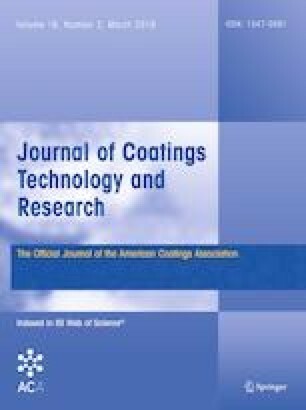 The properties of the new coatings were compared with the properties of coatings produced based on the commercial epoxy resin Ep 6 and a resin synthesized with ECH and OA (EOA) described earlier in our publication.23 The choice of hardener was also important. In the present work, glycolysis of waste PET with triethylene glycol in PET/TEG weight ratios of 55/45 wt/wt was carried out. The resulting product had a saponification value (SV) of 242 mgKOH/g, a number average molecular weight of 710 g/mol, and a dispersity index of 1.8 determined using SEC. According to Mansour,27 the depolymerization products consist mostly of TEG–(TA–TEG)n where n = 1–3 with a number average molecular weight of 704 g/mol and a dispersity index of 1.16 for a 60/40 wt/wt PET/TEG ratio. 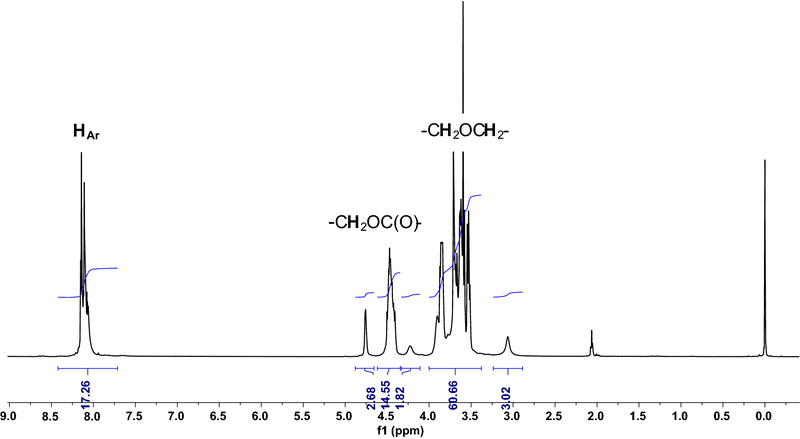 Structural identification was performed via NMR spectroscopy (Fig. 3). The incorporation of TEG in the polyester chain by transesterification produced an additional wide proton signal of –CH2O–CH2– ether groups in the range of 3.45–4.00 ppm. It is noted, however, that these groups are also present in PET as a result of diethylene glycol (DEG) formation during the production of PET through the direct esterification process.28 Therefore, the two separate signals of carboxyl methylene groups (–CH2OC(O)–) in the region of 4.35–4.60 and 4.68–4.84 ppm on the spectrum, resulting from their different chemical surroundings, namely the bonding of carboxyl groups with TEG or ethylene glycol (EG), prove single-handedly that the PET degradation process was successful and produced the expected results. Furthermore, the signal in the 7.60–8.70 ppm range confirms the presence of terephthalic acid (TA) units of PET degradation. 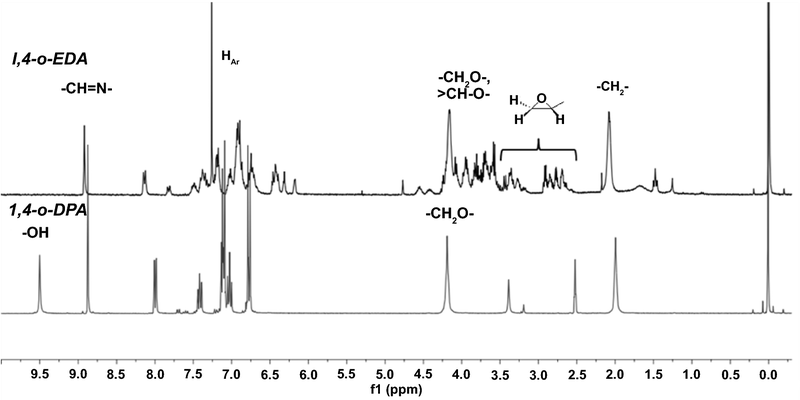 An ESI–MS analysis was not performed immediately after the PET glycolysis reaction. However, the signals visible in the ESI–MS spectrum of the product PEOA2 (Figs. 11 and 10a) make it possible to estimate their strength. This is possible because there are nonreacted PET glycolysis products and their epoxy derivatives left in the test sample. Also, their fragments are built into the epoxy resin. Terephthalic acid diesters with a EG end on the one side and a TEG end on the other or with the same glycol type end on both sides are included in the mixture. Moreover, there is also a signal of a TEG–TA-EG-TA-DEG-type oligoester present. In the Schiff base epoxy resin synthesis with the use of 1,x-o-DPA, a 30-fold excess of ECH was employed, the amount of which was empirically determined in a series of reactions, where its share varied from 1:10 to 1:40. At this reagent ratio range, the highest molecular weights were achieved at 5% mole of the TEBA catalyst. The aim was to obtain products, whose average weight would be higher than the molecular weight of the diglycidyl ether of a given Schiff base. 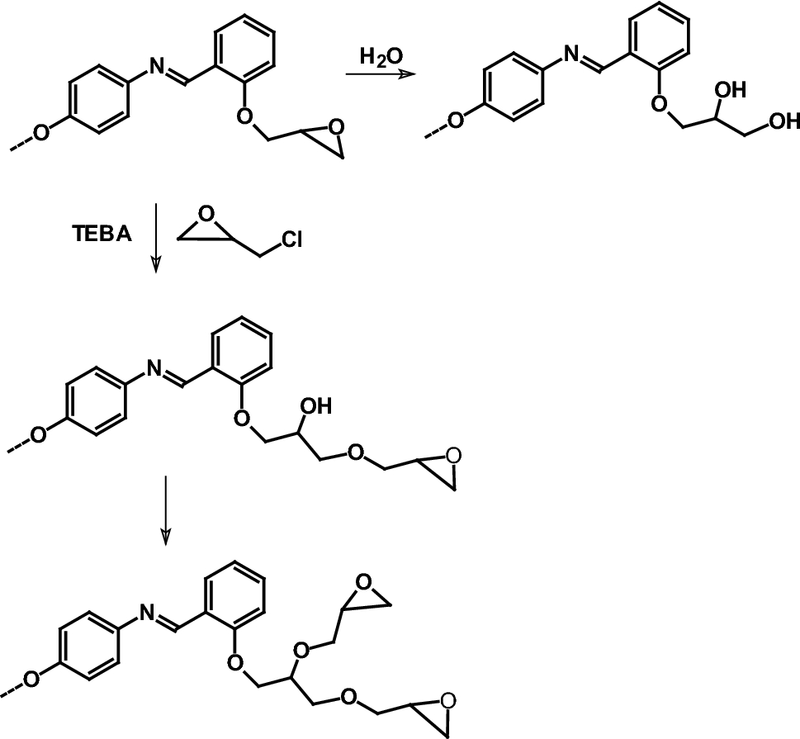 TEBA is a phase-transfer catalyst, which eliminates the normally used aqua solution of NaOH from the process. 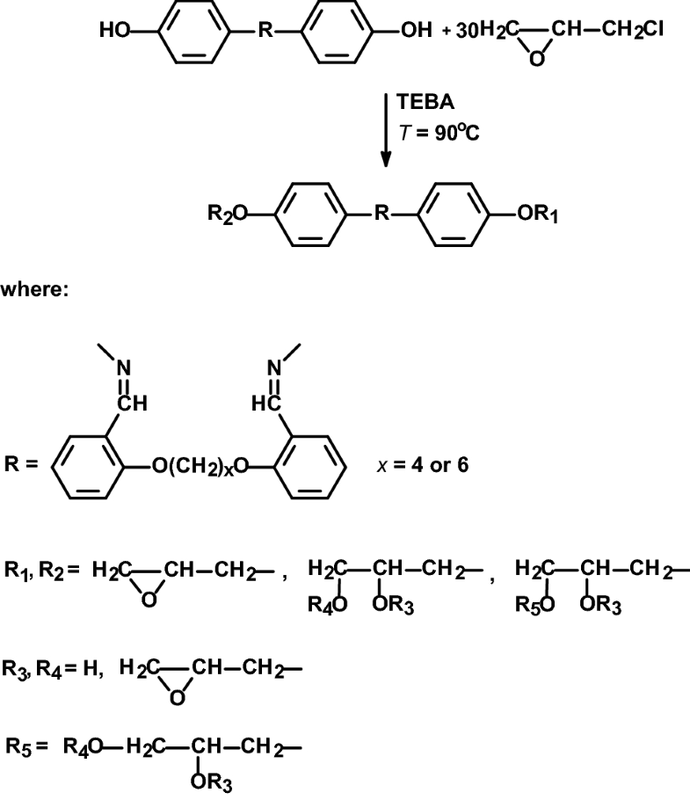 TEBA opens the epoxide ring to form a phenolate anion, which accelerates the addition reaction between phenol and ECH.29 An additional advantage of such conditions is that no insoluble (crosslinked) products are formed in the synthesis despite using a significant excess of ECH. Structural identification was made by means of spectroscopic (NMR) and spectrometric (ESI–MS) techniques. Confirmation that Schiff-based epoxy resins were obtained was demonstrated by the presence of characteristic groups of signals for epoxy ring protons, which appear in the ranges of 2.50–3.00 ppm (–CH2O–), 3.10–3.49 ppm (> CHO–), signals of azomethine protons in the 8.80–9.00 ppm range, and methylene groups in the 1.89–2.11 ppm range. However, there are no hydroxyl group signals of the Schiff base at approximately 9.5 ppm (Fig. 4). 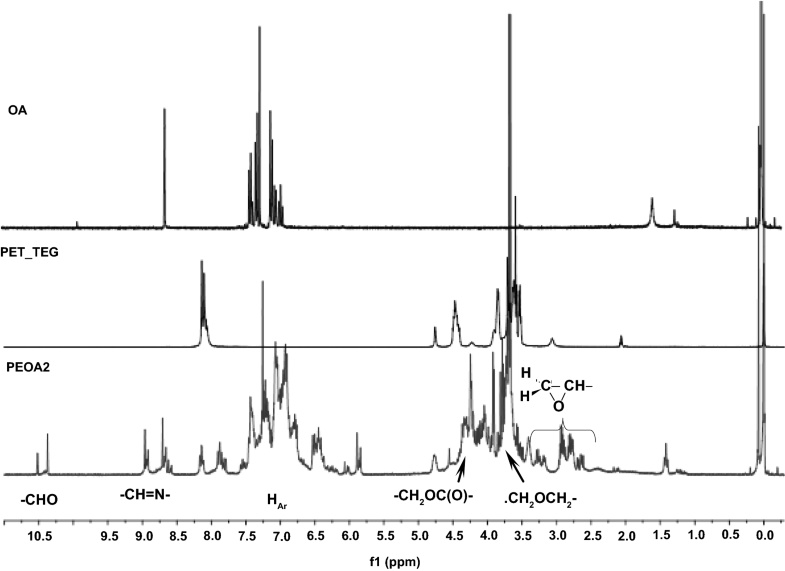 An example ESI–MS analysis of 1,6-o-EDA epoxy resin (Fig. 5) showed that, apart from the expected products, i.e., diglycidyl ethers (Fig. 6), the reaction mixture also contains by-products. Signals of products of the reaction of ECH with the resin’s glycidyl groups or with the secondary hydroxyl groups of glycerin units are also present (Fig. 7). This process leads to the production of resins which are a mixture of di-, tri-, and polyepoxy macromolecules (Fig. 8). These compounds have more polar groups, which impact the properties of the coatings, in particular their adhesion to the metal substrate. 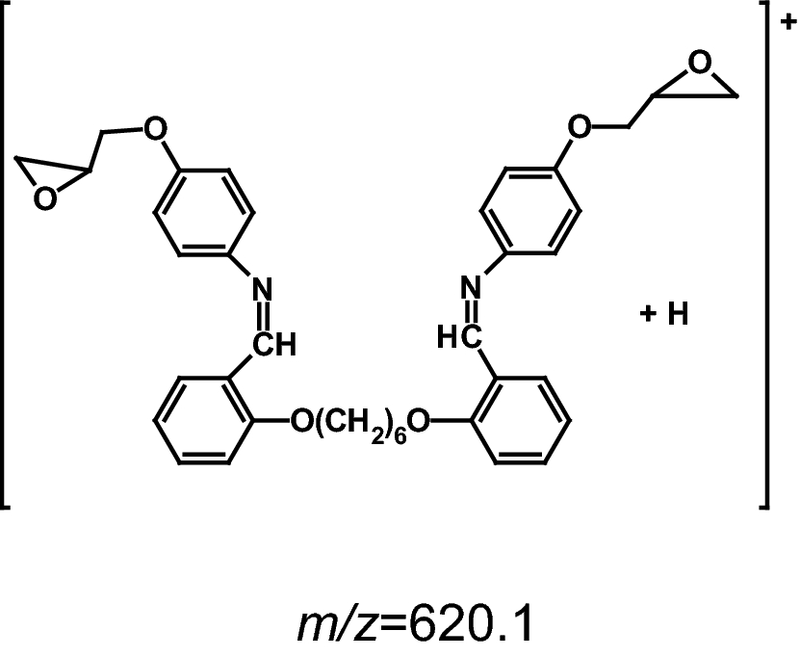 During synthesis, hydrolysis of epoxy groups also takes place, which can lead to a lowering of the epoxy value (EV) (m/z = 510.1; 657.2; 749.2; 879.2; 1008.3) and hydrolysis of the azomethine group to aldehyde groups (m/z = 474.1; 510.1; 566.1; 602.1). Hydrolysis of the epoxy groups or of the azomethine group may occur in the presence of the catalyst used here and a small amount of water. For this reason, ethanol was used to wash off the catalyst; however, it was impossible to completely prevent the side reaction of hydrolysis from taking place. However, not removing the catalyst from the reaction process led to the production of compounds with very low EV (0.01 mol/100 g). One more important observation during the ESI–MS analysis was noted, namely that each of the products consisted of one 1,6-o-DPA unit and the weight of this compound increased only by the addition reaction of subsequent ECH molecules. In the case of synthesis using 1,x-o-DPA, where x = 4 or 6, as expected, resins with lower glass transition temperatures were obtained (− 9.5°C and − 12.0°C, respectively). In the second method, products of waste PET glycolysis were used in the reaction with Schiff base epoxy resin of OA. Analysis of 1H NMR spectra confirms that epoxy resins were obtained, as proven by the presence of characteristic proton signals in the range of 2.50–3.45 ppm coming from epoxy groups, which overlaps proton signals from groups –OCH2 from products of PET glycolysis in the range of 3.50–4.50 ppm. Moreover, proton signals in the range 8.49–9.08 ppm coming from azomethine groups in PEOA are observed (Fig. 9). Free aldehyde groups visible in the 10.30–10.55 range are indicative of the fact that here, hydrolysis of azomethine groups also occurred. 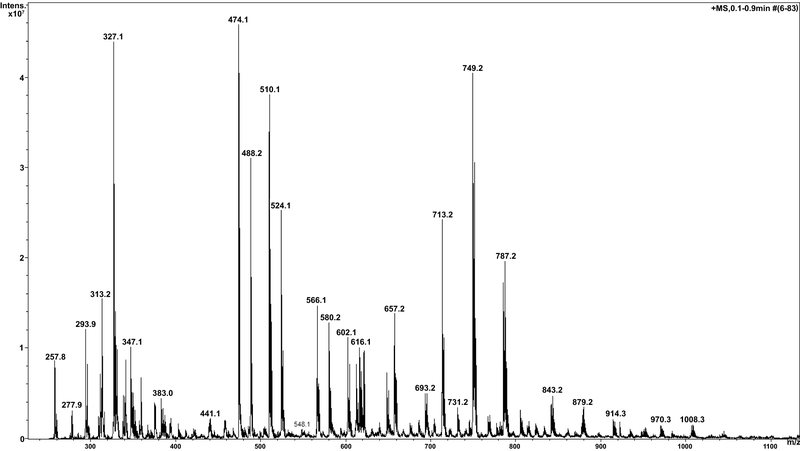 In the ESI–MS spectrum of a sample of material obtained in the PEOA2 epoxy resin reaction, m/z = 779.1 and 832.2 signals are present which, as expected, correspond to products containing OA units and units of terephthalic acid diester and ethylene glycol (Figs. 10d, 10e and 11). It is known that the ESI–MS analysis is typically used to determine the molecular weights and it allows for the determination of the slight differences in the chemical structure of mixture of products. However, value of each peak on the y-axis is relative intensity (%) and it does not correspond to the amount of product in the mixture. Unreacted products of the glycolysis of PET carried out by means of triethylene glycol are also present in the mixture (m/z = 343.0 and 431.0) (Fig. 10a). Moreover, free hydroxyl groups of products PET_TEG react with epichlorohydrin, which is confirmed by signals m/z = 453.1 and 473.1 (Fig. 10b). Similarly, Schiff base epoxy resin of OA (m/z = 521.1; 613.1; 649.1, 743.1) is still present in the mixture (Fig. 10c). As expected, a Schiff epoxy resin with a low glass transition temperature of − 30.8°C and − 33.37°C was obtained. Using analogous reagents and reaction conditions but without PET_TEG, products with a glass transition temperature of 29.9°C were produced. The next stage of the tests involved the preparation of coatings from the synthesized epoxy resins using two types of hardeners, namely poly(oxypropylene diamine) (Jeffamine D-230) with a lower molecular weight (M = 230 g/mol) and a polyamide based on dimerized fatty acids and polyamines (Epikure 3115-X-70). The clearest, most transparent, smoothest and the highest gloss coating was achieved using 1,6-o-EDA. Despite the modification of epoxy resin and the introduction of a flexibility spacer between the mesogenic groups, it was not possible to produce coatings with good mechanical properties when Jeffamine D-230 was used as a hardener. Almost every time Epikure 3115-X-70 as hardener was used, flexible coatings were obtained as evidenced by the impact test results (Table 2). The use of Jeffamine with a low molecular mass was not sufficient to produce impact-resistant coatings. The coating based on EOA2, modified using PET glycolysis products and hardened with polyamide, was characterized by good adhesion to the substrate, which was better than that of Ep 6. This is most probably due to the additional presence of many hydroxyl groups in the flexible, hydrophilic ends of the chain and of oxyethylene units deriving from PET_TEG. PET_TEG products, which do not have epoxy groups and do not undergo crosslinking, can play the role of plasticizers, similarly to the commonly used phthalates. Based on the results, Schiff base epoxy resin modified by PET_TEG (PEOA2) and exhibiting the best mechanical properties was selected. The following tests were also performed using two different hardeners: tensile strength, elongation at break, and flexural rigidity. For comparison, similar studies were carried out for commercial resin Ep 6. Results are presented in Table 3. Samples PEOA2 and Ep 6 cured using Epikure 3115-X-70 are much more flexible than the samples where Jeffamine D-230 was used as a hardener, which confirms the worst mechanical properties of coatings derived from them, as described earlier. On the other hand, a significant role is played by the presence of PET_TEG in PEOA2, where despite using the Jeffamine D-230, cured resin is more flexible than the sample Ep 6. Based on the results of the mechanical properties, we can see that the coating with the most potential is the coating based on PEOA2. Obtained new epoxy resins after curing have similar chemical resistance to epoxy resin based on BPA. Two methods of the modification of Schiff base epoxy resin in order to obtain flexible organic coatings with very good physical and mechanical properties were investigated. The first method of modification involves the use of a Schiff base, derivatives of 2-HB, with a flexibility spacer between the mesogenic units in a reaction with epichlorohydrin. The second one involves the introduction of waste PET degradation products into a synthesis reaction between N,N’-bis(2-hydroxybenzylidene)-4,4’-oxydianiline and epichlorohydrin. Both modifications allow for obtaining epoxy resins with low glass transition temperatures from − 9.5 to − 12.0°C using the first method and from − 30.8 to − 33.4°C using the second method. Synthesized resins with two hardeners, Jeffamine D-230 and Epikure 3115-X-70, were used to obtain organic coatings. The properties of coatings were determined and compared with the properties of coatings based on commercial resin Epidian 6. Based on the results of the mechanical properties, we can see that the coating based on PEOA2, cured with Epikure 3115-X-70, has the best potential as the alternative for epoxy resins based on bisphenol A.